Kroop is a large, some would say fat, man, weighing well over 200 pounds and standing only 5 feet tall. He exudes an air of neglect, perhaps even despair, from the bushy tufts of black hair behind his ears, to his rotting teeth, to the stains on his filthy apron. He walks with a wallowing waddle, particularly when drunk, but is capable of surprising acts of strength. Kroop talks with a thick Shackles accent, which some people find hard to follow. He’s had so many lashes that his back is like tanned leather, and he claims to not even feel the bite of the lash anymore. After 44 years in the school of hard knocks, Kroop is a man who clearly cares little for himself or what people think of him. Kroop’s favorite chicken, a large black cockerel named Black-Hearted Bezebel, often perches on the cook’s shoulder and even talks to him, or so Kroop occasionally drunkenly claims. 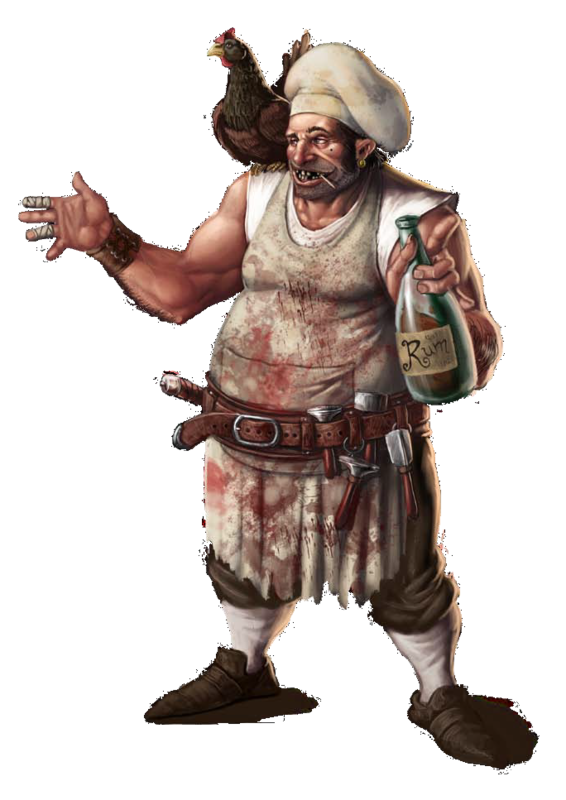 Kroop was trained as a professional chef at the Lobster’s Armor, one of Port Peril’s most popular (and expensive) restaurants, but when he was thrown out after being accused of inappropriate behavior with his assistant, he ended up plying his trade with several sailing vessels in the Shackles before embarking on Captain Barnabas Harrigan’s Wormwood, where he served as ship’s cook for three years. Kroop’s drinking led him to bet his own life against Captain Harrigan in a card game one drunken night 2 years ago. Kroop lost, and his life became Harrigan’s to do with what he would. 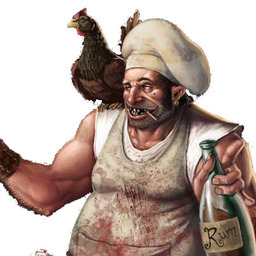 Kroop’s only joys aboard the Wormwood were drinking, swapping yarns with Cut-Throat Grok, and his chickens. A man who clearly cared little for himself or what others thought of him, he remained a kind man at heart, beneath the cynical, washed-up exterior. He has been born again on the Man’s Promise, having gone from being insensibly drunk every other day to maybe one day a week. Kroop has seen a more honorable way of life in the PCs, and he intends to make the most of this opportunity. Kroop is quite a skilled chef, when he has good raw materials to work with. He has excellent knowledge of the Shackles and the region’s perils, personalities, and possibilities. He also has handy communication skills and can help out in a fight if needed. Though fond of all the PCs, he is most fond of Reiko, feeling very protective of her. Rosie Cusswell’s appreciation of his cooking makes her one of his favorites, too. During Combat Kroop is no fighter, and prefers attacking opponents from behind, preferably with a sneak attack, rather than facing foes in a fair fight. Morale When the odds are against him, Kroop fights like a cornered dog. He feels he has nothing to lose, and rarely backs down. If protecting a friend, he is fiercely brave, and fights to the death.